Russia’s 21,000-tonne nuclear powered icebreaker, the Taymyr, has powered down its 171-megawatt nuclear reactor and will rely on the help of diesel engines to make its way into its home port some time before 11 pm Murmansk time today, a Rosatomflot nuclear fleet official said. 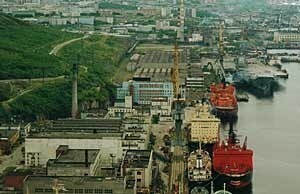 “The exact arrival depends on sea condition,” the nuclear fleet official told Bellona Web by telephone from Murmansk, asking that he not be identified. Another of Rosatomflot’s icebreakers, the Rossiya, has been sailing ahead of the Taymyr to break ice and smooth its passage to its home-port at Atomflot in Murmansk. The 23-year-old icebreaker developed a leak in its primary coolant system – spilling some 20 to 30 litres of coolant liquid a day through a fault weld or metal fatigue – on May 5 after completing a mission on the frozen Yenisei River in Siberia and starting its return trip through Arctic waters. The new announcement bore stark comparison to the ongoing disaster at Japan’s Fukushima Daiichi plant, where inability to cool the reactors has been the primary cause of the Chernobyl level incident. Rosatomflot, however, stressed the event could be registered as a zero on the seven-point International Nuclear Event Scale. “The radiation parameters on all the open decks and indoor facilities of the icebreaker are at natural levels,” Rosatomflot General Director Vyacheslav Ruksha said in a statement. But neither the fleet nor its parent company, state nuclear corporation Rosatom, which is in charge of building reactors both in Russia and abroad, had released any information about the incident since the initial reports came out, and the number of crew members and their condition remains unclear. National television has also avoided any mention of the episode, according to local observers. Konstantin Knyazevsky, deputy technical director of Atomflot told a press conference last week that the hole through which the cooling water is spilling is on square millimeter. The leak is the third such accident to strike Russian nuclear icebreakers in recent years –and the second to strike the Taymyr in as many years. A similar leak was reported on board the same vessel one year ago while the Arktika nuclear icebreaker had nuclear coolant problems a few years earlier. But the Taymyr’s current plight represents the first such situation to occur during the reactor’s performance at sea. The Taimyr nuclear icebreaker is one of two icebreakers built for the Soviet Union by Findland’s Wartsila shipbuilder in the late 1980s, the other being the Vaygach. The hulls were constructed in Finland and the reactors installed in Russia. A military analysts said the incident as described thus far – while posing no serious environmental danger – pointed to a serious disruption on normal operations. “Even a small radiation leak inside the reactor structure is a serious event,” said independent military analyst Pavel Felgenhauer in a telephone interview with Bellona Web. “If the leak is small, they might be able to repair it. But it is hard to do because the reactor is hot,” Felgenhauer noted.